ATTENTION Embroidery Business Owner: Are you looking for a way to get your personal life back? But Do You Really Know How To Achieve That? If only I could have had a mentor to help me through those struggles, it would not have taken me so long! I could have had my pricing in place so much quicker and not have been in the position where I almost lost my business because I had it all wrong! I could have had a business plan that worked, one that I could follow and knew what I was going to be doing each day! I could have even had my business organized so that I was not always in a mess with paperwork and confused as to what to do next! I would not have faced so many discouraging times! Many days I wanted to walk out and never go back! Does any of this sound like issues that you are facing in your embroidery business? 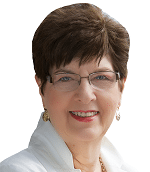 I am Joyce Jagger, The Embroidery Coach and with the help of a mentor and business coach I have overcome these struggles and can now help other embroiderers and guide them on an easier path to success with their embroidery business! I have taught hundreds of embroiderers how to build a profitable embroidery business and now it is your time to stop struggling and start reaping the benefits and success that you work so hard to achieve! I hate to see any embroidery business owner struggle in their business. It is not at all necessary! This really is not that hard, but without the proper help and guidance from someone that has been there and done that, it is really hard! Watching an embroiderer turn their struggling embroidery business into a profitable embroidery business is the biggest payback I could possibly ask for! That is when I know that my system is working! An Embroidery Business can be very lucrative when you have the right systems, approach, and tools in place! I am here to help you create those systems and make it easy for you to turn your dream into a reality! You hop out of bed, you quickly do your household chores and then you start on your business, or you get ready to go to your shop to start your work for the day! The feeling you will have when you go to your desk, pick up your list and you can get right to it! You know exactly what you have to do! Your Plan is totally in place! Your entire day is totally planned out, your office is in great shape, your workroom is fully organized and you feel so good! You can get started with your day knowing that you really do have it all together! I created a program, “9 Steps To A Profitable Embroidery Business‚” that is going to help you take that struggle out of your business, help you bring in more money and help to make your life a whole lot easier! This is one of the best courses that I have ever created! After you get through with this course you may decide that what you really want is some personal training. Most people do! Personal Training will help you move your business faster and you will see profits increase sooner! How to Get your Pricing Right once and for all so that you are bringing in more money! How to Get your Embroidery Business Organized so that you can keep track of your orders and be able to plan your production much easier! How to Create a 12 Months Marketing Plan so that you can have work coming in even during the lean times. A plan that will work! How not to be discouraged when it gets tough. You will receive the Encouragement to get you through those tough times! We all have them! It’s Your Time To Start Reaping The Benefits From Your Embroidery Business and Start Increasing Your Profits! If you continue doing what you are doing, you will continue getting what you are getting! 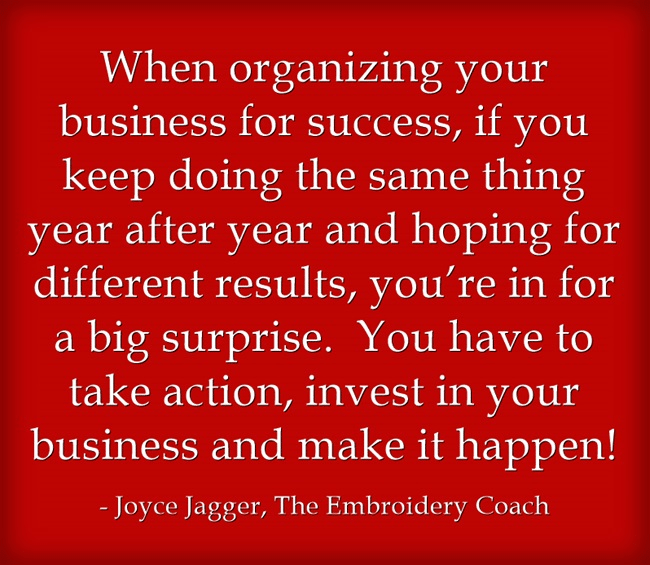 You simply cannot Grow your Embroidery Business with no system in place to get organized or stay organized! You cannot grow your Embroidery Business if you are not making enough money to pay the bills or take a salary for yourself! It is just not possible! Sooner or later you will throw in the towel! Don‚’t let that happen to you! You will have the time to increase your customer base! Your work will flow more evenly! You May Even Get Paid! You will have more FREE time! It’s Your Time To Have That Happy Feeling! 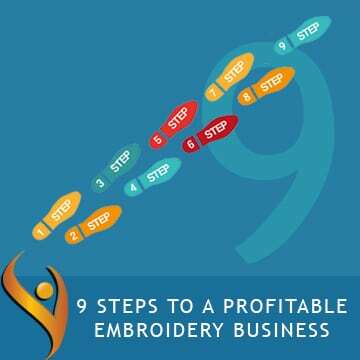 The “9 Steps To A Profitable Embroidery Business‚” is a 9 Module program that will help you get your business organized and teach you how to start making money with your Embroidery Business! BONUS: At the end of your 9 lessons you will have a personal coaching call with me. On the coaching call, you can ask me questions to get the personal help that you need to move your business to the next level! At the end of the 9 lessons, you will have access to all of this information forever! This will be inside of a protected membership site for your eyes only! This is your chance to finally get your Embroidery Business Organized and get it running the way that you have always dreamed! You will receive your weekly bite-sized lesson so that you can still work your business at the same time that you are re-organizing your business and creating a whole new plan for your business! I do not want you to feel overwhelmed! 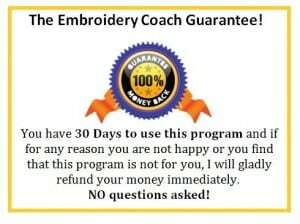 So What Is The Investment In The 9 Steps To A Profitable Embroidery Business Coaching Program That Will Help Transform My Embroidery Business Into A Well Organized Money Making Business? Get Started With the 1st Step TODAY! 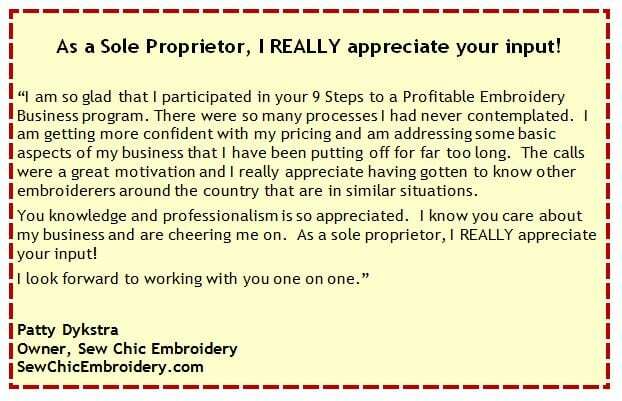 The investment in the “9 Steps To A Profitable Embroidery Business” program is insignificant when you consider it could revolutionize your entire business! This could make the difference between having a mediocre embroidery business and having one that is thriving! Here is what is Included in this Comprehensive 9 Steps To A Profitable Embroidery Business Coaching Program! next step as you are finishing the course! P.S. Let’s face it. If you keep doing what you are doing, nothing is going to change. Are you going to keep worrying about your business and fretting about money 24 hours/day and 7 days/week? Or are you going to spend the time to make the changes that need to be made to get your business organized and making money? P.P.S. 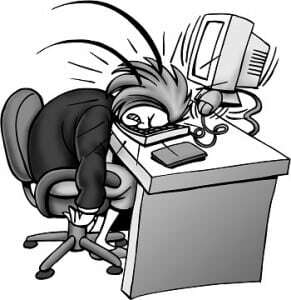 Imagine a life where you don‚’t have to worry about your business 24/7! Worrying about your business takes a toll on you and affects your family and friends as well as you! It does not have to be that way! 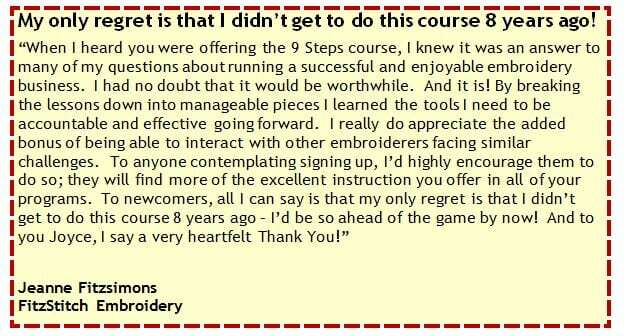 Take action now and you could be one of those Embroiderers that are thrilled with your results.